Double Take! 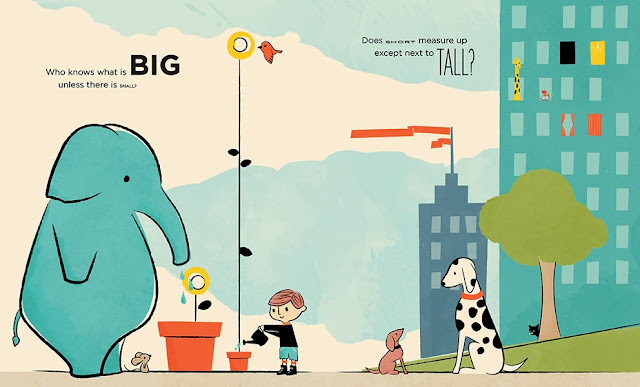 : A New Look at Opposites, written by Susan Hood and illustrated by Jay Fleck, takes a fresh new look at opposites and how they reflect points of view and relativity. Readers follow a young boy, a blue elephant, and a black cat as they move about town demonstrating the opposites they find around them. Hood -- author of more than two hundred picture books! -- continues to grow as she pushes her text past a simple exploration of concepts. Instead, she poses larger questions with her comparisons, such as how we can know what big is without small, and does near become far when far comes nearer. 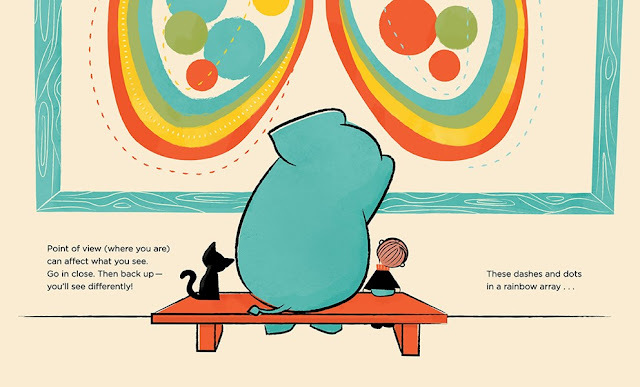 The book encourages readers to see things differently and to ponder the perfection that lies in the symbiotic nature of opposites: one cannot exist without the other. Fleck's digital illustrations are faded so that they have a vintage feel, but they also possess sharp lines and colors that give them depth. The text is designed so that each of the opposites shows there as well, like when we see the word "strong" in bold and the word "weak" faded out and small. Attention to detail in the book's design and illustrations is remarkable: we see the big elephant watering the small plant and the short boy watering the tall plant, but in the background we also have other examples of big and small. There's always more than meets the eye with Fleck's illustrations, and that kind of detailing makes for an impressive illustrator debut. Double Take! 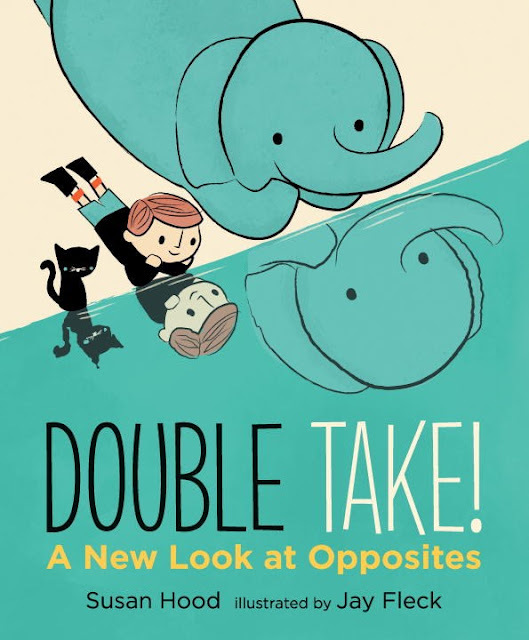 : A New Look at Opposites publishes this June from Candlewick Studio!